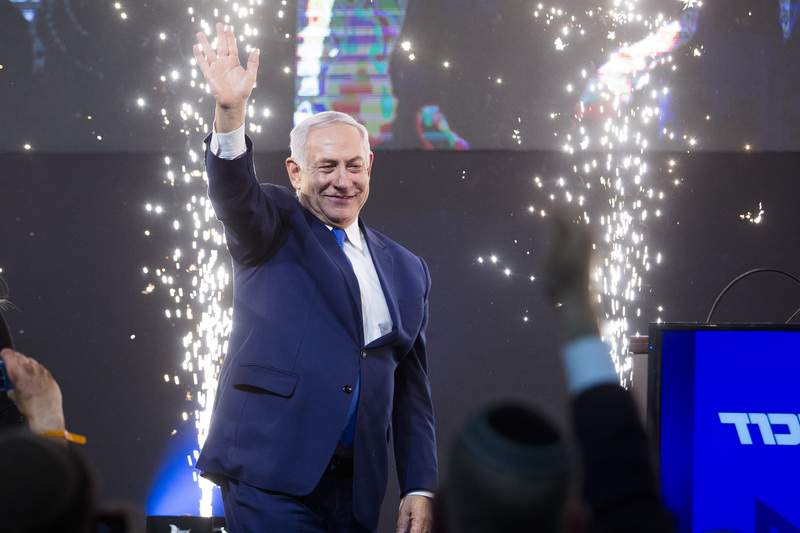 Prime Minister Benjamin Netanyahu declared victory after exit polls from Israel's election showed his party won more parliamentary seats than his main challenger on April 10. The apparent victory of Prime Minister Benjamin Netanyahu’s Likud party in Israeli elections clouds prospects for the Trump administration’s yet-to-be-released peace plan and could further undermine bipartisan support for Israel in Congress, according to analysts. If Netanyahu succeeds in forming the next government, he is expected to annex parts of the West Bank as part of a possible deal with coalition partners to get the law changed in a way that would give him immunity from prosecution on corruption and bribery charges. President Trump called Netanyahu to congratulate him on Wednesday and predicted his reelection would increase the odds of a peace breakthrough. But annexation will spell the end of a two-state solution that Palestinians desire, making it all but impossible for them to embrace the secret peace plan that Trump’s son-in-law and adviser Jared Kushner has been working on for more than a year. And while a Netanyahu win means continuity of the closest-ever relationship between an Israeli prime minister and an American president, it threatens to alienate many liberal Democrats who already are critical of Netanyahu’s policies toward the Palestinians. “We will see a fundamental change in the U.S.-Israel relationship from here forward,” said Jeremy Ben-Ami, president of J Street, a pro-Israel, pro-peace group. “This will be the breaking point of the long-term, seven-decade bipartisan consensus of support for what Israel is doing. The move to annexation, cementing Palestinian disenfranchisement, is not acceptable for a majority of the Democratic Party and most American liberal Jews. In a tight election, Netanyahu may have benefited from unilateral policy moves that Trump began to make soon after entering the White House. Trump visited Jerusalem four months after taking office and was the first president to pray at the Western Wall. He recognized Jerusalem as Israel’s capital and moved the U.S. Embassy there from Tel Aviv. He validated Israeli sovereignty over the disputed Golan Heights, giving Netanyahu the opening to say territory Israel gained in a defensive war can be kept. He designated Iran’s Islamic Revolutionary Guard Corps as a terrorist organization, a key Netanyahu wish. He pressured the Palestinians economically and diplomatically. And neither Trump nor Secretary of State Mike Pompeo said anything when Netanyahu talked about annexing the West Bank. David Friedman, the U.S. ambassador to Israel, hinted at Trump’s sympathy toward West Bank annexation when he told the annual gathering of the American Israel Public Affairs Committee last month that the Trump administration understands Israel’s need to have “overriding security control” in the West Bank in any peace plan. Previous administrations also have made their preferences known in Israeli politics, usually in support of U.S. proposals for peace negotiations. In 1992, President George H.W. Bush conditioned the approval of $10 billion in U.S. loan guarantees for Israel on a moratorium on settlements. Ahead of the 1996 election, President Bill Clinton organized a summit in Egypt that generated a powerful image of Israeli Prime Minister Shimon Peres standing with the leaders of 30 nations. He went to Israel to appear with Peres at peace rallies and promised more U.S. assistance. “But nothing I have witnessed in decades watching or as a partner in the U.S.-Israel relation comes anywhere near the effort made by the Trump administration, from its inception, to acquiesce, validate and support just about anything Benjamin Netanyahu has done,” Miller said. David Makovsky, director of the Project on Arab-Israel Relations at the Washington Institute for Near East Policy, said Netanyahu’s victory may be short-lived. Even some of his allies have refused to back proposed legislation that would grant him immunity from prosecution in looming corruption cases. Netanyahu, who has denied wrongdoing, could have to step down before his term is completed if it does not pass. Carol Morello is the diplomatic correspondent for The Washington Post, covering the State Department. She previously wrote about demographics and the census. She has worked at The Post since 2000. Before that, she was a reporter for the Philadelphia Inquirer and USA Today.